Thirty years in politics has become big business for Judy Biggert. She voted nine times to raise her own pay. Biggert voted for a $250,000 tax cut for millionaires like herself that forces the middle class to pay more. And Biggert collected $170,000 from her Springfield pension, on top of her $174,000 paycheck from Congress every year. Thirty years in politics has paid off for Judy Biggert. This race has long been a slogging slugfest. And it looks like it’ll stay that way right up to the end. In a House district that is 51-percent Latino, state Rep. Angelo “Skip” Saviano said Tuesday he has lined up backing from the best-known Latino politician in Illinois. Saviano (R-Elmwood Park), who is running against Democrat Kathleen Willis for the 77th House District, plans to announce an endorsement by U.S. Rep. Luis Gutierrez (D-Ill.) during an event Tuesday at Saviano’s Wood Dale campaign office. “The leaders of the community know what I’ve done, and I’ve been working to get that message out,” Saviano told the Chicago Sun-Times. “This just solidifies my whole record with the community,” Saviano said of Gutierrez’ endorsement. Best comment wins a hard-to-get invitation to my election night party, which is being co-sponsored by Google. Yes, Google. I’m not making that up. I swear. The prospect of Joe Walsh being re-elected to Congress is a bit like the threat of an actual zombie apocalypse: absolutely terrifying. But while a zombie apocalypse is pretty unlikely, Joe Walsh’s reelection is a very real possibility and we only have 6 days left to prevent it. Will you contribute $10 now to help us defeat Joe Walsh? 2. Both would bring back to life something better left alone. The idea of dead bodies rising from their graves is pretty scary. So are the retro policies Joe Walsh wants to resurrect - including big tax giveaways to the wealthy and policies that side with big corporations that pollute the air and ship jobs overseas. 3. No matter how fast you run away, you won’t be able to escape its effects. If Joe Walsh is reelected, it would have consequences for everyone - from seniors who rely on Medicare to students seeking an affordable education. We’re having some Halloween fun, but truly, we can’t afford to head into Election Day unprepared. It might be Halloween, but what is a scarier thought than Mitt Romney and Paul Ryan in the White House and the Republicans in control of the Senate? That would be horrible for our country. But we are close to reaching our goal – we need to raise only $2,700 before midnight tonight. Our candidates are counting on your support, so let’s make Halloween the scariest day of the year, not Election Day! Be safe this Halloween. Observe your local ordinances regarding Trick-or-Treating hours, and above all, be on the alert for Democrats who may try to trick you with more debt, higher taxes, more wasteful spending and sucking the blood (money) out of suburban taxpayers with their plan to shift their pension mistakes on suburban homeowners who already pay some of the highest tax rates in the country. House Speaker Mike Madigan, State Senate President John Cullerton and Governor Pat Quinn are plotting, scheming and threatening the state with more of the same, tired, 67% tax hike politics. It’s a poisonous brew, but there’s no need to scream or be frightened. Republican candidates can reverse the curse and put Illinois back on the right track. STOP THE SATELLITE TV TAX! The cable industry is asking lawmakers to place a NEW 5% tax on satellite TV service. HB 5440 is not about fairness, equity or parity – it’s a tax increase on the 1.3 million Illinois families and businesses who subscribe to satellite TV. They cannot afford another NEW tax – not now and not in this economy! •	Satellite TV subscribers will see their monthly bills go up 5%. •	This tax will impact every bar, restaurant and hotel that subscribes to satellite TV service, which will translate into higher prices, decreased revenues, and fewer jobs. •	Rural Illinois has no choice: In many parts of Illinois, cable refuses to provide TV service to rural communities. Satellite TV is their only option. •	Cable’s claim that this discriminatory tax is justified because satellite TV doesn’t pay local franchise fees could not be further from the truth. Cable pays those fees to local towns and cities in exchange for the right to bury cables in the public rights of way—a right that Comcast and Charter value in the tens of billions of dollars in their SEC filings. •	Satellite companies don’t pay franchise fees for one simple reason: We use satellites—unlike cable, we don’t need to dig up streets and sidewalks to deliver our TV service. •	Making satellite subscribers pay franchise fees—or, in this case, an equivalent amount in taxes—would be like taxing the air It’s no different than making airline passengers pay a fee for laying railroad tracks. But a number of residents say they are skeptical of the federal bribery charges and the “new guy” party leaders are suddenly supporting. Many said they were sticking with the familiar. “I just vote Democrat all the way across. Whoever’s there, I give them a chance,” said Percy Winfields, 74, a resident of an apartment complex that caters to seniors. Besides, Winfields said, Smith showed up before Christmas last year and delivered on a promise to provide turkeys to the tenants for the holiday. In my opinion, that’s the classic Democratic machine in a nutshell right there. …Adding... This is also, in a nutshell, a strong example of how spectacularly the Republican Party has completely alienated huge blocs of voters. U.S. Rep. Bobby Schilling (R-Colona) has released his final commercial of the election cycle for the Peoria area, featuring an endorsement from U.S. Rep. Aaron Schock (R-Peoria). Schock is from Peoria and remains popular there, so this will help. * Schilling-Bustos Both Receive Endorsements: Democrat Cheri Bustos received the endorsement of her former employer the Quad City Times where she worked for several years as a reporter and editor. Meantime, incumbent Republican Bobby Schilling picked up the endorsements of the Rock Island Argus and Dispatch and the Galesburg Register Mail. Schilling has also received the nod of the Peoria Journal Star, Rockford Register Star, Freeport Journal Standard and Chicago Tribune. * As I told you late yesterday, Jason Plummer’s campaign held a press conference yesterday to “expose” his Democratic opponent Bill Enyart for being on the public pension dole. But, as it turns out, Enyart is not receiving any pensions. His wife, a retired judge, is. And while Plummer claimed that Enyart and his wife were receiving seven pensions, Enyart’s wife was receiving three, two of which are quite small. Jason Plummer accused Bill Enyart and his family of living large off public pensions Tuesday, a claim Enyart rebutted in the latest fight between the two candidates for Illinois’ 12th congressional district. Plummer, the Republican candidate, claimed Democrat Enyart and his wife, retired Judge Annette Eckert, collect more than $156,000 annually from among three public pension systems. Plummer also claimed Enyart was in line to get at least three more pensions but didn’t produce any documents to prove it. 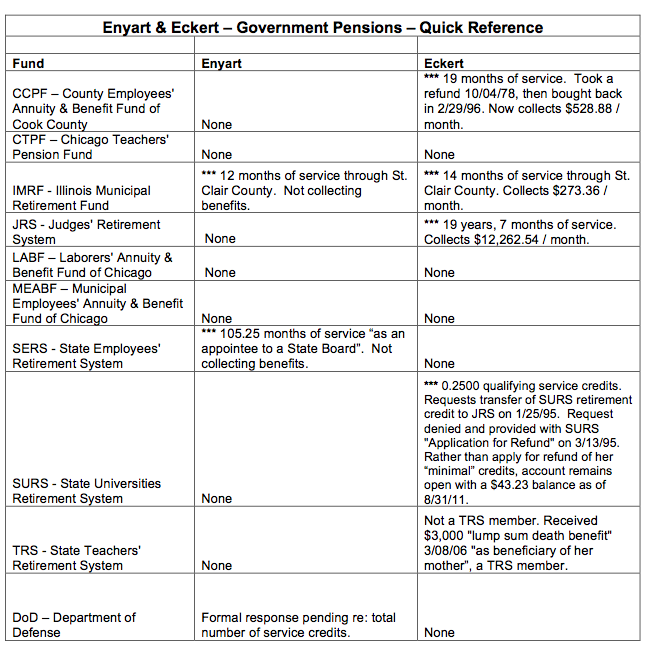 Plummer said what he found on Enyart is indicative of the type of pension abuse “well-connected people” perpetrate in Illinois. Nowhere does the article point out that Plummer more than doubled the number of pensions Eckert actually receives. And nowhere does the paper make clear that Plummer’s own research shows that Enyart himself isn’t receiving a pension. Instead, we just get your basic he-said, he-said crud. * Enyart is planning a press conference this afternoon, so The Southern will have an opportunity to redeem itself. This attack by Plummer, coming on the heels of his campaign’s public insults directed at Enyart’s son, is the most poorly executed and untruthful “planned” earned media attack of any Illinois congressional race this fall. And that’s really saying something, considering. The Chicago Federation of Labor this week released a 30-second television ad aimed at bolstering turnout by working men and women in the November election and encouraging them to remain engaged when lawmakers return to work later in the month to address issues such as pension reform. The ad, titled “Our Voice,” recalls that union members have worked for generation to build not only our cities but our communities as well. In recent years, however, politicians and others have tried to strip workers of their collective bargaining rights and cut wages, health care benefits and retirement plans. The best way that working men and women can fend of these attacks is by exercising their voice at the ballot box. The Chicago Federation of Labor made a substantial buy for broadcast television for the week before Election Day. After the election, a modified ad will run for an additional week urging working people to keep a careful eye on politicians as they address issues such as collective bargaining and pension reform. There’s been a surprising amount of conjecture coming our way lately about the possibility of Mitt Romney inching closer to Barack Obama in Illinois. We’ve not paid much attention to that conjecture until it started to be uttered in some national circles and a handful of reporters we respect called to ask if there was anything to it. For those of you uninitiated in the Illinois political scene — outside of following the hijinks of our politicians in Popular Prison Monthly — Chicago and Suburban Cook County each account for about 20% of the vote in the Land of Lincoln. No matter how well Romney does in the five suburban “collar counties” or downstate (the rest of Illinois outside of Chicago, Suburban Cook & the Collars), the huge hunk of burning love that his home base provides the president simply cannot be toppled. Some of our projections include turnout scenarios that put Romney as close as 10 points from the lead, but there is no way that Chicagoland is going to abandon its Favorite Son.